Like radiant floor heating systems, heated driveways utilize a network of heating cables (or PEX tubing) that is embedded under the surface to heat the driveway and keep it clear of snow and ice. When a snowstorm hits, an advanced activation device (snow sensor) detects the snow and temperature and then signals the controller. Power is then sent to the electric heating cable and the driveway is warmed as the first snowflakes descend. Liquid-based systems (hydronic) also utilize a snow sensor to trigger the system. Specially treated water is heated in a boiler which is then pumped through the PEX tubing. Both systems feature an “afterrun” function, whereby the system continues to operate for a short time after the storm to ensure that the driveway is dry to prevent ice from forming. Electric driveway heating systems have no moving parts and are maintenance free. Given their reliable performance and energy efficient operation, heated driveway snow melting systems have become popular with home and business owners alike. Driveway heating systems provide reliable performance and convenience through fully automated, maintenance-free operation. The radiant heating systems operate only when needed, enhancing safety and eliminating the need for costly, time consuming manual snow removal. In addition to increasing property values, driveway heating systems can also help to protect driveways from structural damage and surrounding landscapes from the harmful effects of salt and snowmelt chemicals. Automated heated driveway systems can be installed in small custom snow melting applications as well as large commercial projects such as outdoor parking structures, walkways, loading docks, runaway truck ramps and more. Contact a radiant heat professional today at 888.488.9276. FULLY AUTOMATED Electric and hydronic heated driveway systems utilize an advanced WS-2C aerial-mount or ETOK ground-mount activation device (snow sensor) that senses the weather conditions and activates the system when needed. The systems also feature manual override capability so snowdrifts or ice that formed in shadowed areas can be melted. The systems operate when needed and shutoff afterwards, making them energy efficient as well. ENVIRONMENTALLY FRIENDLY Electric driveway heating systems utilize renewable energy. Radiant snow melting systems offer a clean way to keep driveways clear of snow and ice. The systems eliminate the need for shovels and snow plows as well as the need for salt and harsh snowmelt chemicals that harm the nearby grass and vegetation (and eliminate the harmful runoff from these chemicals. CONVENIENT & ECONOMICAL Driveway snow melting systems are not difficult to install and can be easily customized to meet each project's unique installation and performance demands. Installing a driveway snow melting system can increase the value of your property. ENHANCED SAFETY Radiant snow melting and deicing systems can dramatically enhance safety for pedestrians. Keeping sidewalks and driveways free of dangerous ice and snow enhances safety, which also reduces the chances of litigation resulting from personal injuries on your property. DURABLE, RUGGED DESIGN Snow melting systems are designed to provide reliable snow removal specific to typical winters in each installation's location. The industry leading radiant heat cable used for heated driveways features a 10-year manufacturer warranty. VERSATILE Electric heated driveways are easy to customize and suitable for installation in virtually all types of common surfaces, including: concrete, under pavers (tile, brick, etc.) and even hot asphalt applications. HIGHLY CUSTOMIZABLE Radiant snowmelt systems can be easily customized to accommodate uniquely shaped residential driveways and walkways in addition to commercial parking lots, loading platforms, bridges, etc. The heat cable is easily installed to heat steps and narrow walkways as well as two 24-inch wide tire tracks. 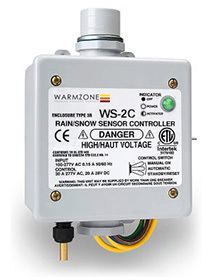 The WS-2C snow sensor activation device provides reliable snow detection and control for commercial and residential driveway heating and snow melting applications. The unit detects both precipitation and ambient temperature. When weather conditions warrant, the sensor triggers the snow melting system’s contactor panel or controller, when then sends power to the heating element to warm the surface. The WS-2C is a low cost, easy-to-install, energy-saving alternative to thermostats, manual switches, or timer controls. The versatile unit mounts outdoors but you can choose the optional CDP-2 remote panel for indoor override.